The next European Film Forum (EFF) will take place alongside the Vilnius Film Festival “Kino pavasaris”. 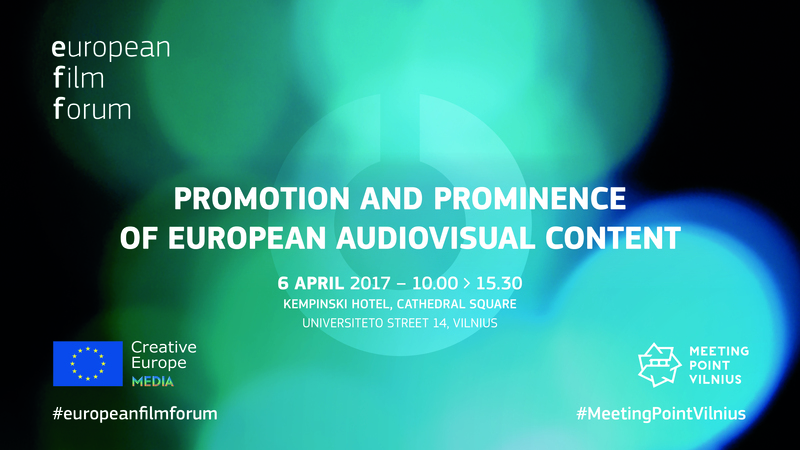 It will focus on promotion and prominence of the audiovisual works and it will be organised during the 8th edition of "Meeting Point Vilnius" - an international film industry event accompanying the Vilnius Film Festival. How to build sustainable businesses models through promotion? How to help the content travel beyond borders while preserving cultural diversity and identity? These are some of the topics that will be discussed with the film industry. For the first time the EFF goes to Vilnius and it is a good opportunity to look more closely at how to increase the cultural and commercial impact of films from smaller scale markets. Likewise, current trends in talent development and how to help the new generation of filmmakers to build a ‘career ladder’ from the earliest stages of development, feature amongst other topics to be explored during the event. The full programme is available here and the event will be live streamed here. The European Film Forum is a structured dialogue between policy makers and stakeholders.This dialogue takes place notably during Film Festivals, under different formats (such as conferences, roundtable discussions and workshops).